250mm White Bullnose Replacement Fascia Board - 5m length. The Bullnose Fascias differ from the 18mm Replacement Fascias by not having a return lip underneath the boards. These can fit direct onto rafter ends where the fascias are mounted close to the wall. These are used on old buildings / stone buildings which have no soffit board. These boards do have a recess should a soffit board be required - as per the image. These fascia boards are designed to be fitted direct to rafter ends and do not require a backing board due to thier rigid linear strength. This makes them suitable for total replacement, new build applications, window boards and reveal liners. 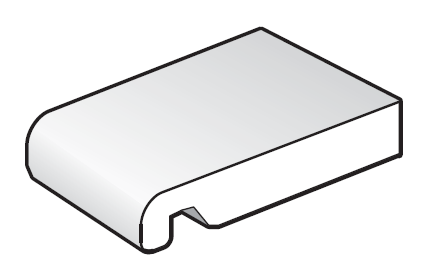 These fascia boards are 16mm thick with a recess of 6mm for insertion of a soffit board if required.